If you are a Member of the EAUC, you already recognise the benefits that being part of a community of sustainability professionals can bring to you and your institution/ organisation. If you know someone who shares our common vision and want them to join our thriving community to make a difference, there has never been a better time to do so than now! If you think that you know of someone or an institution/company who would benefit from our support and the various services and benefits of that Membership offers, then why not recommend them for EAUC Membership? Have someone in mind – use these links to see if they’re already an Educational or Company Member. 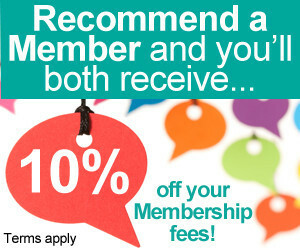 If your nominee joins the EAUC, they will get 10% off their Membership fee. As a thank you, you’ll get 10% off your next renewal fee! Simply download the Recommend a Member form below, fill in your details and pass it to your nominee along with the links to more information (you'll find this below). The nominee then needs to complete the rest of the form and return to us at info@eauc.org.uk. We’ll take it from there! 15. The EAUC reserves the right to terminate the scheme or change the terms at its own discretion at any time.